Forget the fancy mustard, you can bet this badass custom Rolls Royce pickup is packin' nothing but BBQ sauce in the glovebox. 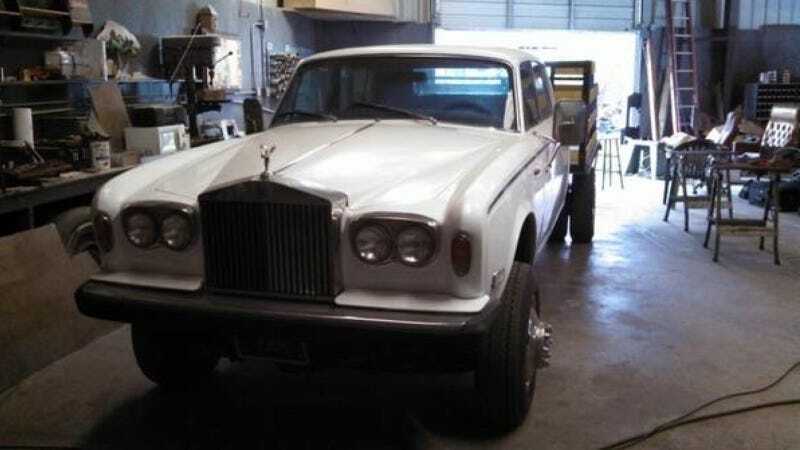 Currently for sale on Tampa, Florida Craigslist this mashup rig looks like it's basically an old GM heavy duty truck with a Rolls Royce body dropped on top, sans trunk. It's powered by a 350 Chevy with a Turbo 400 transmission, and two thirty-gallon fuel tanks so you can make it all the way to the gas station and back again a few extra moments later. Dude wants $75,000, a price that far exceeds the value of a used Rolls Royce and a whole parking lot of old dually pickups. But you gotta admit, this thing's pretty clean inside and out.